Teresa Palmer holds onto her baby bump while attending The Art of Wellness event during the David Jones AW19 Season Launch held at The Museum of Old and New Art (MONA) on Wednesday (February 6) in Hobart, Australia. The evening before, the 32-year-old pregnant actress was accompanied by her dapper hubby Mark Webber as they attended another event for the David Jones AW19 Season Launch: The Art of Living. 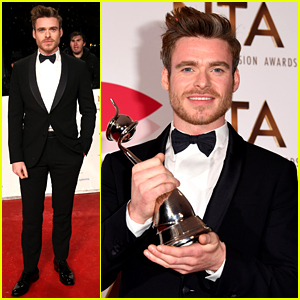 Richard Madden is all smiles while holding his award in the winners room at the 2019 National Television Awards on Tuesday (January 22) at The O2 Arena in London, England. The 32-year-old actor won the award for Best Drama Performance for his work on the show Bodyguard. Richard beat out Peaky Blinders‘ Cillian Murphy, Killing Eve‘s Jodie Comer, Doctor Who‘s Jodie Whitaker, and Our Girl‘s Michelle Keegan. Bodyguard also won the award for Best New Drama. Earlier in the month, Richard also won an award at the Golden Globes for his performance. Also in attendance at the show was Teresa Palmer, who is pregnant with her third child. Kaia Gerber is strutting her stuff for Chanel! The 17-year-old model hit the runway during the Chanel Metiers D’Art show on Tuesday night (December 5) at The Metropolitan Museum of Art in New York City. Tons of celebs stepped out to see the show including Lily-Rose Depp, Teresa Palmer and Rowan Blanchard. Other attendees included Ella Hunt, Mackenzie Foy, Julia Goldani Telles and Sadie Sink. “What a dream! Last night at #ChanelMetiersDArt @chanelofficial,” Teresa wrote on her Instagram. Teresa Palmer has some very exciting news to share – she’s pregnant with her third child! The 32-year-old Aussie actress and her husband Mark Webber are expecting baby number three, a girl this time. Best known for her work in Hacksaw Ridge and I Am Number Four, Teresa will next be seen in the drama Ride Like a Girl, in which she plays the first female jockey to win the Melbourne Cup.